THIS BOOK IS a story of failure—the failure of the Islamic Republic, despite thirty years of propaganda and political education, to inculcate in a new generation of Iranians faith in the ideology of the regime. The children of the revolution of 1979 have turned their backs on its values; and this was nowhere more evident than in the mass protests against the manipulated presidential elections of 2009. The young joined the protests in hordes; and the regime’s harsh suppression of these protests, along with the widespread arrests, torture and deaths in prison that followed, were the final steps in delegitimizing the Islamic Republic and its barren ideology. Hejazi tells the story of his generation against the background of the revolution that shook Iran to its roots three decades ago. He describes the hope the revolution engendered and the despair that followed; its major turning points; and the men who shaped it. Into this narrative, he weaves the broader history of Iran, its modern experience, and the impact on the Iranian imagination of the heroic figures of the great Persian epic, the Shahnameh, and of the Shi’ite branch of Islam. Hejazi’s own family was middle class, not affluent but comfortable, whose trajectory was not atypical of many upwardly mobile families under the monarchy. His grandmother was the daughter of a baker. She was married off at the age of thirteen and left her husband when he took a second and then a third wife. “It was about time someone showed men that they didn’t own their wives,” she said. “We’re human too.” But his father was secular and made a different life for his family. Hejazi spent the first four years of his life in England where his father was completing his doctorate in engineering. The father went on to become a university professor. Hejazi was eight and back in Iran when he first heard the name of Ayatollah Khomeini who, his mother told him, was the “savior,” the “vicar of the Hidden Imam,” the one whose “face is etched on the moon.” He was only nine when the revolution overthrew the Shah and installed Khomeini in power. His parents, like many of their friends, rejecting the Shah’s autocracy, had embraced the revolution. But, as they discovered, democracy was not what Khomeini had in mind. As for young Arash, his world of Spiderman and Superman vanished, along with the girls in his classroom. The schools were segregated; schoolchildren were handed schoolbooks with the pictures of the Shah torn out, and then new schoolbooks graced with a picture of the scowling Khomeini. He and his schoolmates became religious. If you were not praying and not reciting the Koran, he writes, you were not considered revolutionary and were in trouble. He met Ayatollah Khomeini twice: once when he was nine and the second time when he was twelve. During the first encounter, he tried to kiss the hand of the ayatollah, but it was Khomeini who bent down and kissed the little boy’s forehead. On the second occasion, he stepped forward to speak to Iran’s leader, but Khomeini thrust a hand out for Arash to kiss. The simple, benevolent father of the nation had become an authoritarian ruler. His childhood was scarred by the arrests, executions, and purges that marked the early years of the revolution. Hejazi recalls the exodus of friends and family. Neighborhood revolutionary committees regulated peoples’ lives and acted unpredictably; old scores were settled. People did not feel safe, either on the street or at home. “Good Islamic manners” were expected of everyone, but nobody knew what those manners were. The “cultural revolution” disrupted the lives of university faculty and students. The eight-year war with Iraq brought economic hardship to middle-class families like the Hejazis. Arash writes that the young boys of his generation made a life for themselves by listening to banned music, engaging in forbidden dancing and also reading and discovering what their peers were doing in other countries, even as they waited to be called to the war front. For young Arash, as for so many others of his generation, the country started opening up with the end of the war in 1988, the death of Khomeini the following year, and the two-term presidencies of Hashemi-Rafsanjani and Mohammad Khatami that followed. Under Khatami, “the smiling cleric,” Iran seemed ready once again to join the rest of the world. Hejazi fulfilled a life-long dream when he became a doctor. But he became disenchanted with medicine and launched a publishing house. At the time, he remembers, Paulo Coelho’s novel The Alchemist was all the rage in Iran. Hejazi translated and published Coelho’s Veronika Decides to Die. He and the Brazilian novelist became good friends, and Hejazi arranged for Coelho and his wife to visit Iran, and for Coelho to lecture there. Such things were possible in the Khatami years, but they proved fleeting. As Hejazi notes, Khatami’s second term witnessed a conservative and reactionary backlash, capped by the election of Mahmoud Ahmadinejad as president in 2005. Fearing a velvet revolution in Iran of the type that had overthrown autocratic regimes in Ukraine, Georgia, and elsewhere, the Iranian hardliners went on a rampage. Newspapers were closed, intellectuals were arrested, universities were purged, and civil society activities were monitored. I experienced this crackdown firsthand when I was arrested in 2007, imprisoned, and accused of attempting to foment a revolution in Iran. When Ahmadinejad was elected for a second term in 2009 in a vote that many believed was rigged in his favor, Iranians came out into the streets in hundreds of thousands to protest. The Iranian Spring preceded the Arab Spring. Out of these protests was born the opposition Green Movement, but it was violently crushed. Hejazi graphically describes these events in which he became an inadvertent, and central, player. Among the demonstrators was a young philosophy student named Neda Agha-Soltan. She was shot, and lay bleeding and dying on a Tehran street. 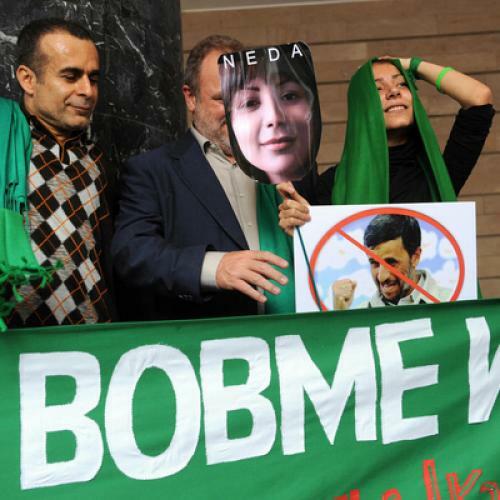 Neda’s picture, captured on a cell phone camera, was broadcast around the world on YouTube and other social media sites; she became the symbol of Iran’s defiant Green Movement. That iconic picture also shows a young man, a doctor, bending over her, trying to save her life. That young physician was Arash Hejazi, who happened to be close by when Neda fell. It was Hejazi who pronounced her dead. “I saw her gaze before she passed, the gaze of the gazelle that has been running from the hunter and now lies on the ground … an arrow deep in her side,” Hejazi writes of the moment of her death. Hejazi’s heartfelt, well-written book speaks for a generation of Iranians. Many of them, like Hejazi, were driven into exile abroad by the regime’s brutality and arbitrariness. Many, like Agha-Soltan, gave their lives for an Iran governed by the rule of law rather than the whims of an autocrat. Haleh Esfandiari is the director of the Middle East Program at the Woodrow Wilson International Center for Scholars, and the author of My Prison, My Home: One Woman’s Story of Captivity in Iran.